Mulching is something many homeowners decide to do around their homes when the spring rolls around. If you haven’t mulched yet or refreshed your existing mulch, we encourage you to do so, and we’ve got some helpful information for you. Mulch can provide several benefits to the plant beds around a home, such as protecting the roots, retaining moisture and reducing the water needs, and keeping the weeds down. Certain types of mulch are also beneficial for adding nutrients to the soil around the plants, essentially helping them thrive. Adding an inch or two around the plants can be beneficial. However, you do not want to cover the bases of your plants because this can harm them. It’s a good idea to leave just a little space around the bases – just gently pull the mulch away. How often should you replace your mulch or top dress it? It depends on what you use, but as a rule, new mulch should be added every one to three years, depending on the needs of the plants and the budget that you’re working off of. Which Is the Best Mulch to Use? There are a few different mulches that can be used, depending on the needs that you have. Two of the more popular mulches are bark and Fertimulch. Fertimulch is a darker, finer mulch that can feed the soil as it decomposes around it. Bark is much longer, lighter and sometimes come in red. It is less expensive and can control weeds. 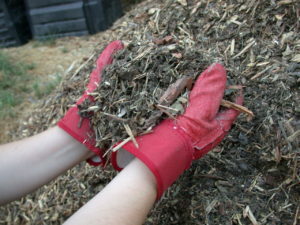 You can also mulch with items such as shredded yard waste, cocoa shells, and other organic material. What your budget and needs are can help you determine which one is the best for your particular garden and mulch needs. Having your yard mulched regularly will provide a noticeable difference around your home. In addition to providing the other benefits that have been mentioned. So when the spring time rolls around, don’t forget the mulch! Here are some other benefits to mulching your yard. Speak with us here at Architectural Landscape Design to find out how we can help you design and implement the best landscape plan for your home, but also provide you with those maintenance needs that you have for the spring and summer months ahead. Topdressing mulch as needed is part of the landscaping maintenance package that you can purchase from us, providing you with a way to have it covered, every time it is needed. We are a licensed Minnesota landscape design, installation and maintenance company, and we offer a wide range of residential and commercial landscaping services in the greater Minneapolis and St. Paul metro area.